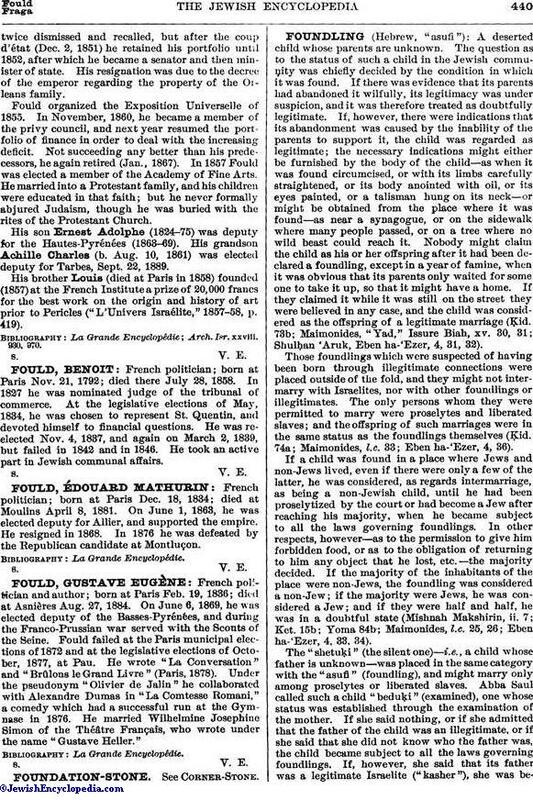 French politician and author; born at Paris Feb. 19, 1836; died at Asnières Aug. 27, 1884. On June 6, 1869, he was elected deputy of the Basses-Pyrénées, and during the Franco-Prussian war served with the Scouts of the Seine. Fould failed at the Paris municipal elections of 1872 and at the legislative elections of October, 1877, at Pau. He wrote "La Conversation" and "Brûlons le Grand Livre" (Paris, 1878). Under the pseudonym "Olivier de Jalin" he collaborated with Alexandre Dumas in "La Comtesse Romani," a comedy which had a successful run at the Gymnase in 1876. He married Wilhelmine Josephine Simon of the Théâtre Français, who wrote under the name "Gustave Heller."